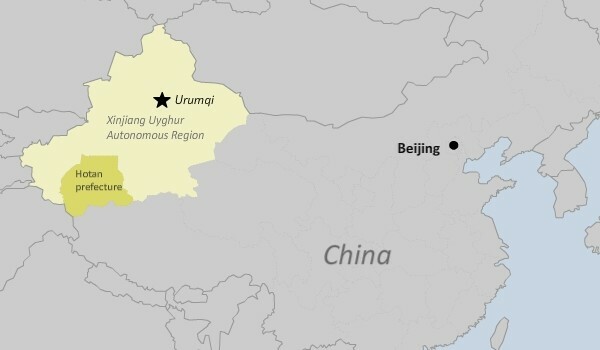 At least 17 Uyghurs have been detained in connection with a Sept. 10 explosion in the Chinese region of Xinjiang that killed a deputy police chief and seriously injured other officers raiding the home of suspected radicals, RFA learned on Monday. The blast in a village in Guma (In Chinese, Pishan) County of Hotan (Hetian) Prefecture killed or wounded more than 10 people, including police and Uyghurs, World Uyghur Congress (WUC) spokesman Dilxat Raxit told RFA’s Cantonese service on Monday. Police have detained 17 Uyghurs, including four women, since the incident, added the spokesman for the Sweden-based WUC, a Uyghur exile organization. A police officer from the county told RFA’s Uyghur Service on Sunday that Gheyret Mamut, 45, was killed instantly. He was initially identified as the Guma County police chief, but was the deputy police chief, RFA learned on Monday. Police have imposed a tight news blockade on the incident, and Hotan and Guma authorities declined to comment on the case when reached by telephone by RFA on Monday, directing reporters to China’s state media, which have remained silent on the blast. Accounts provided to RFA’s Uyghur Service by several policemen and villagers on Sunday said Gheyret Mamut was killed when a bomb exploded in the basement of a house in No. 23 Village of Kokterek Township in Guma County. He and four policemen were searching the house of a 30-something couple who were on an official blacklist for suspected radical behavior, police from neighboring districts told RFA. But the sources differed on the fate of the other policemen, with one officer from a neighboring township saying the three policemen were badly injured and taken to hospital, but a farmer from a nearby village saying he had heard from other villagers that the three patrolmen were dead on arrival at the hospital. “When they entered the cellar at the center of the house, suddenly a bomb exploded, and Gheyret Mamut died on the spot. Three of the officers were heavily injured,” Turup Abbas, deputy chief of Guma County Police Department, told RFA on Sunday. The farmer, from No. 21 Village of Kokterek Township, said the village Communist Party secretary discussed the explosion at a village meeting in general terms and warned villagers to “avoid spreading rumors” and to report strangers to police. “From the neighbors I heard that the police chief died in the cellar, and the three police officers were dead when they arrived at the hospital,” the farmer added. The farmer also said that some villagers had heard nobody was home when the police raided the booby-trapped house, while others had heard that the Uyghurs the officers were looking for were hiding in the basement. Turup Abbas said he was told that nobody was in the house when the police conducted the raid. Memet Eli, a police officer in Kokterek Township, told RFA on Sunday that he had interrogated a couple that lived in the house but did not remember their names. He said the couple owned a fast-food restaurant and had a four-year-old daughter. They were “blacklisted because of signs of extremism in their life,” he added. Kokterek Township was the hometown of the perpetrators of a May 2014 bombing at a market in Xinjiang’s capital Urumqi that killed 43 people, including the four attackers.